This cottage is ideally suited for a peaceful retreat, with outstanding and unobstructed views of Lake Okanagan. Located 30 km north of Westbank and Kelowna, 30 minutes drive along the Westside Road, in La Casa Resort Development. It is also 7 hours drive from Calgary or 4 hours from Vancouver. In the summer, you will be able to enjoy all water sports on site, with the warm waters of Lake Okanagan through swimming, boating (marina slots available), aqua-park, as well as onsite pool and hot tub. Others amenities at the Resort include 2 tennis courts, a mini golf course for the entire family, beach volleyball court, a marina & boat launch. If you are seeking a winter holiday, this cottage will be a great base to enjoy skiing at the Big White Ski Resort (1 hour 45 minutes), Silver Star Resort (1 hour 15 minutes) and Crystal Mountain in Westbank (1 hour), or nearby snowshoeing and skiing in the backcountry. There are over 20 wineries, as well as cheese factories, to visit and taste their products, spread out within 30-90 minutes driving from the cottage. As well as several golf courses for another great way to enjoy the hot sun of the Okanagan Valley. Closer to your vacation base, you are only 5 minutes driving north to the Fintry Provincial Park, and 10 minutes from horse riding and ATV riding at Fintry High Farm. 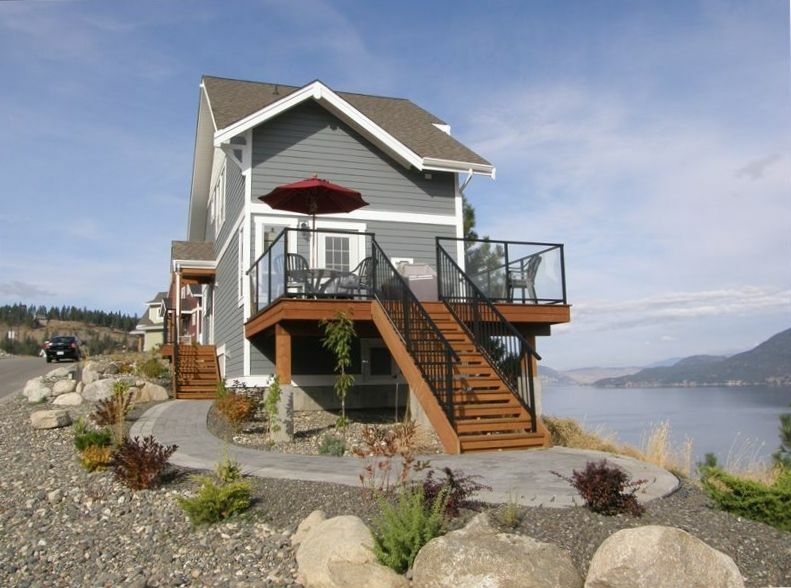 Or simply lay back on the deck with a glass of wine, overlooking the waters and boating on Lake Okanagan. 5 minutes walk / 1 minute drive to the lake, marina and aqua park, on a quiet paved road. Public phone available, otherwise there is cellphone coverage. In the unit, with laundry soap provided. Large enough for 3 cars by the cottage. Fully unobstructed view of Lake Okanagan, looking east and south. Six chairs with table and umbrella. 2 courts in the resort. Bring your racquets/ball. Mini-golf on site; bring your own putter and ball. We stayed here for a week in September and it was just perfect for the 3 of us. What a beautiful view. The weather was cold and rainy but we enjoyed our stay. The cottage had everything we needed. Thank you Normand for all the information you sent and letting us enjoy your beautiful place! We really enjoyed spending time with our friends in such a beautiful and relaxing setting. The house was technically a 3 bed house but the 3rd bedroom was on a mezzanine above the family room and was not very private. The house was perfect for two couples. It was set up in such a way that one couple could have upstairs (with their own separate facilities) and the other couple could have downstairs (also with their own facilities). The kitchen was very well stocked with cooking equipment, and it was a pleasure to eat off quality crockery, with quality cutlery. There were plenty of wine and beer glasses and also a catering sized box of plastic wrap, foil and paper towel. There was also a generous supply of dish washing tablets and washing machine soap to use. The outside deck with table chairs and umbrella allowed another space from which to enjoy the magic Okanagan scenery. this property was excellent and we were very happy with it. Was a very good vacation. Lots of out door activities for all. House it self had all things we needed. Just some games for kids would have being great as the previous house had lots of kid games. Had beautiful view of the lake and sun rise. Overall very good place for a vacation. Beautiful spot with an amazing view! The cottage had everything that we needed. Normand was great to deal with and was very accommodating when we had to cut short our vacation due to a family emergency. We would definitely love to return in the near future! The view was very impressive! I really loved this property. It was simple with no frills, what is described, is what you get. Perfect view. Posted rated do not include 13% taxes, such as: 5% GST (Good and Services Tax), and 8% PST (Provincial Sales Tax) Minimum rental age is 30 years old. Damage Deposit of $600 CAN Cancellation policy: Our cancellation policy is FIRM. Cancellation notice must be given by email to the owner. For any booking made for any season of the year, if cancellation is 30 days or less from the check-in date, no refund is given. If you cancel 45 to 31 days from check-in date, with bookings made for any season of the year, 50% of the total rental fees received for the stay is kept and the 50% remainder is refunded. If cancellation is made more than 45 days before check-in date, for bookings made for anytime of the year, the 35% is not refundable. In either case of cancellation, the damage deposit is returned.